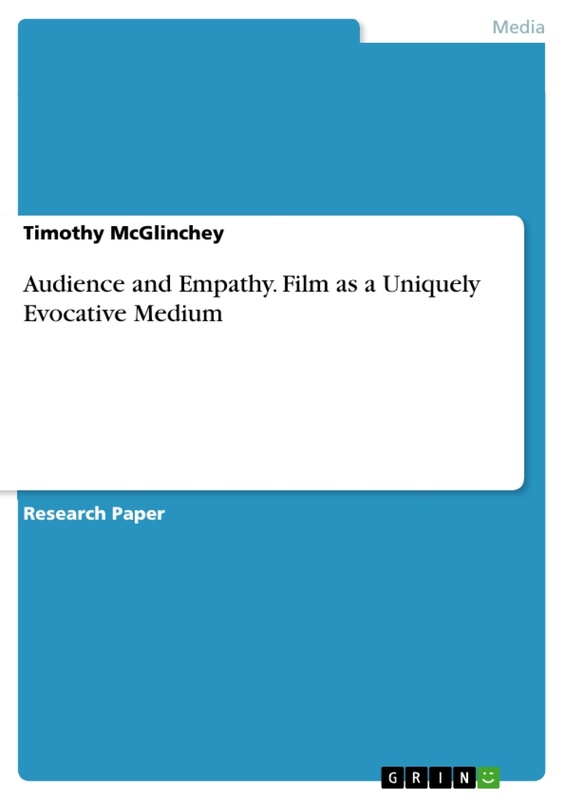 Taking this into consideration, this project seeks to scrutinise empathy’s role in the film viewing experience with a focus on emotional response, whilst specifically investigating its impact in the context of fiction film. And so raises the primary research question: To what extent, and how, is fictional film capable of eliciting emotion in its audience? In recognising the breadth of this topic and the complexity of its key themes, several other questions arise that must inevitably be addressed: how is emotional response measured and its causes identified? What are the barriers to affective response? What impact does subjectivity and individual interpretation have on empathy and the viewer’s reactions to film? What barriers and limitations may exist which could influence the affective response to film? Throughout this project the answers to these questions, and many others, will become pivotal to a reliable response to the overarching research questions. Both empathy and affect, as concepts, carry with them a degree of ambiguity regarding definition and the criteria by which they are determined or measured. This is of course problematic when considering the research process involved in this project which relies so heavily on the identification of them both. It is therefore crucial that the chosen methodological approaches offer depth and rigour, to the furthest extent possible. In this case, the methodology will include a screening, questionnaires given both before and after the film, and finally a focus group. The film that was screened, Pay It Forward (Leder, 2000) follows a young boy, Trevor, who is given an assignment by his teacher to put into action an idea that can make a positive impact on the world. Meanwhile, he himself is coping with serious family difficulties including an alcoholic mother and absent father. Though an ultimately uplifting story which reinforces the goodness in people, it tragically ends with Trevor being killed trying to rescue his friend. It is primarily for its emotional appeal that this was chosen. There were six participants who took part in the screening, and because the project does not specifically focus on the impact of gender, age, or any other distinguishing categories, they were chosen at random. The questionnaires they were given before the screening were designed to gauge each participant’s general viewing habits and preference for film genre, as such factors could influence the interpretation of data. After the screening, they were presented with one more questionnaire which asked more specific, quantitative questions regarding the movie they had just watched. However, as Kumar (2005) rightly explains, questionnaires on their own do not provide respondents with the opportunity to clarify the questions asked of them, nor fully elaborate in the answers they give. With this in mind, a focus group was arranged which, in this case, was incredibly beneficial in its capacity to provide a thorough level of detail to each participant’s response to the film, as well as contextualise their questionnaire answers. emphasises the importance that empathy and identification has in fiction as it “conceals or defers the recognition of dissimilitude” (1990:40). Carroll, however, a key figure to this research investigation, argues against the process of “character-identification” and empathy altogether by claiming that there is often asymmetry between the feelings of an actor and the feelings of the observer. Instead, he advocates the concept of sympathy as a more suitable alternative. And so, having explored only a fraction of the dense academic field that concerns itself with such topics as those discussed within, it is important to now begin aligning the knowledge this field offers to the key questions of this research project. In doing so, the intention is to define and elucidate the relationship between affect and empathy, in order to understand better the complex dynamics of the film-viewing experience. Empathy. Do we need more of it for more morality? What makes the films of David Lynch and Jim Jarmusch postmodern?